Summary: After a major power outage in the city, Jim Hobbs makes his way out the subway tunnel he got stuck in and just starts walking. Everything just comes to a head and Jim decides he needs a break from school, his fractured family and the city itself, so he hitches a ride out to the Prairies and comes across an abandoned farm called Bliss where he learns to take care of himself without modern conveniences. Bliss is next to Majestic farm and when Jim gets to know a couple of his neighbours, he decides to seek work on their farm so he can get to know them better. But the farm turns out to be a cult, and Jim’s friendship with Miriam and her nephew Thomas forces him to make some tough choices when he finds out Miriam is about to be married off to an older man named Hosea. Review: This was my second time reading Road to Bliss by Joan Clark, and I appreciated it a lot more than I did the first time. Because I knew what was going to happen and that it was a slower paced story, I was able to relax into the read and enjoy it for what it was, a bit of a commentary on over-dependence on electricity and other amenities, the beauty of self-reliance and connection to nature, and an exploration of cult life in regards to thinking for yourself. Jim is a genuine character who goes from being a city guy to an independent young man who can take care of himself and others. He’s willing and skilled at learning by experience, and as a result adapts well to the challenges of life on the Prairies. It was something he perhaps knew all along, but living in the city with his sister and mother didn’t really give him the opportunity to be self-reliant in that way. He’s also quite mature and trustworthy. That said, life with his family wasn’t all terrible; his sister is clearly responsible for his evolved attitudes about female rights which helps a great deal with his interactions with Miriam and the cult itself. His parents love him and end up coming together after a separation when Jim goes across the country by himself. I also loved the role Bliss’ previous owners play in Jim’s life. Although they aren’t around, Hector and Iris are kind of Jim’s surrogate parents with the stories he hears about them and their lingering presence in their home and schoolhouse. Though Jim doesn’t meet them in person till the end, they have a profound affect on the course of his life. I truly enjoyed the book’s ponderous nature. There are some incredibly deep moments of insight on Jim’s part, and I have included my favourites in the Memorable Quotes section. Because it’s a bit of a slow read and takes time to develop, I would recommend it for older, experienced teen readers, but it’s a lovely contrast of life in different parts of Canada. At the end of my read, I’m left with an incredible longing to venture out to the Prairies and view the unadulterated night sky as Jim does. I also wish that I had the kind of autonomy that would allow me to live like Jim, solitary and in communion with nature. “Even after he’d made the decision to return to Majestic Farm. Jim continued to sit on the well top in the cool air, watching the sky blossom into the night. For some reason, tonight’s sky reminded him of a vast garden: the stars flickering like tiny flowers, the Milky Way winding itself around them like a giant creeper. Venus white as a daisy. Mars poppy red now that its orbit was bringing it closer to Earth. 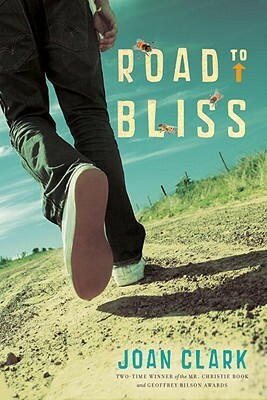 Road to Bliss by Joan Clark is published by Doubleday Canada, (2009).